Retinal photography is an amazing photo op for your eyes! Much more than just a pretty picture though, the images from this advanced technology provide our eye doctor with essential information about the health of your eyes. We can monitor your ocular health over time, comparing the baseline image to future pictures taken at your yearly Greensboro eye exam. When we inspect the digital images of your retina, we examine closely for problems related to both vision and your overall health. Signs of many life-threatening conditions, such as risk of stroke, diabetes, high blood pressure, high cholesterol, and brain tumors, can appear in the pictures taken with digital retinal photography. Our eye doctor is trained to detect even the minutest changes. 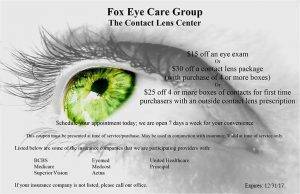 Upgrade your eye care by scheduling a Greensboro eye exam at Fox Eye Care. When detected early, many ocular diseases can be treated with high success – and before any damage to your vision has occurred. By using retinal photography in your Greensboro eye exam, our eye doctor can spot any signs of a problem when they first appear. We will store these images digitally as a permanent record of your retinal condition. Digital retinal photography facilitates the diagnosis of many common eye diseases, such as diabetic retinopathy, macular degeneration, and glaucoma. A range of advanced Digital Retinal Cameras are available nowadays. Their features vary, yet all of these advanced technologies utilize safe, red-free light, LCD monitors, clear color contrasts, angiography imaging, and angle variations. The high-resolution and highly detailed digital images can be transferred quickly to be displayed on a high-grade screen. The procedure is efficient and comfortable, performed as a part of a comprehensive eye exam in our Greensboro office, based on our eye doctor’s judgement. All you need to do is stare into the device one eye at a time. You will see a non-disturbing flash of light, which means that the image was captured. That’s the whole process. No dilating eye drops are needed, and taking the picture is safe, quick, non-invasive, and painless. Our eye doctor will then review the images and discuss the results with you. To experience digital retinal photography with your own eyes, book an appointment for your annual Greensboro eye exam at Fox Eye Care! Clarifye uses advanced technology for the most accurate & patient-friendly eye exam. Clarifye digital eye exams now available at Fox Eye Care optometrists in Greensboro, NC.